Purchase a kit to make fondant flowers from Amazon.com. How do you make fondant flowers? Quite easily, once you know the steps involved! Fondant icing is quite different from buttercream frosting. It has a dough-like consistency that allows you to roll it out in sheets to use for a variety of decorating needs. You can use it to create an ultra smooth surface over a layer of buttercream, and you can also cut shapes from it to use as design elements on your cakes. Flowers are one of the most popular design elements made using fondant icing, and they can look quite realistic when made by a practiced hand. Whether you decide to work with fondant or gum paste, the technique is basically the same. Purchase fondant cutters and tools separately or in convenient kits. You can also cut out your shapes freehand if you find that easier to do, but cutters do provide better uniformity. 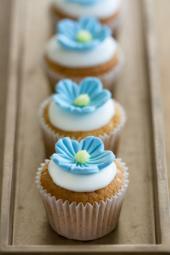 A daisy is one of the easiest fondant flowers to make so it's great for beginners. Here are the steps you need to follow to create daisies you can layer on your cake. Cover your board with parchment and lightly dust it with powdered sugar. Roll out a sheet of dough as thin as you can without tearing it, about 1/8-inch. Using a daisy cutter, make two cutouts for each daisy you want to create. Carefully peel the excess fondant away from your pieces. Cover your rolled fondant with plastic wrap to keep it from drying while you work on assembling your flower. Carefully transfer one cut out to your foam pad, and run your veining tool lightly down the center of each petal, stopping just before you reach the tip. This will give your petals a slightly cupped, more life-like shape. Prepare a second cut out in the same manner. Paint the center of one cut out with egg white, and layer the second cut out on top so that each individual petal is visible from both pieces. Using a small round cutter, cut out a center for your daisy. Paint it with a little yellow gel coloring, and glue it to the center of your daisy using the egg white. Carefully lift your daisy away from the pad and lay it on a flower former to dry for several hours. Once dried, you can glue it to your cake with a little buttercream. Once you've made a single daisy, it's easy to create them assembly line-style so you can produce dozens of daisies in a single session. After making daisies, you'll find it easy to use the same basic techniques when creating other types of flowers. 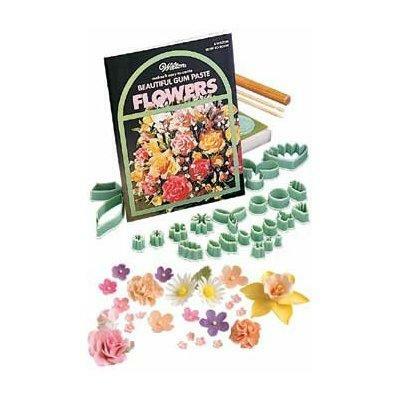 Most gum paste/fondant flower making kits come with directions for making many popular flowers from roses to chrysanthemums to lilies and more. Some of these flowers require wires and floral tape to assemble the petals and leaves together to create wonderful bouquets. This technique is slightly more advanced, but still not too difficult even for a beginner. You can master the art of flower making with a little practice, and the next time someone asks, "How do you make fondant flowers," you'll be able to pass along what you've learned.